Addis Ababa, Ethiopia; 3rd May 2018 – The African Union Commission Deputy Chairperson Amb. Kwesi Quartey today held bilateral talks with Heiko Maas, the Minister of Foreign Affairs of the Federal Republic of Germany. The Deputy Chairperson congratulated Minister Maas on his appointment and welcomed his presence at the African Union headquarters; his first visit to Africa since his appointment. Both leaders underscored the importance of multilateralism in the socio-economic development of Africa and Europe. Amb. Kwesi and Minister Maas mutually agreed on the need for education and skills improvement as a key factor in the realization of Africa’s prospects in structural transformation. They observed the nexus between quality education, skills improvement and the quest for peace and security, industrialization, integration and social improvement. On the peace and security status in the continent, Amb. Kwesi noted that Africa had recorded substantial progress in averting instability in member states, particularly that which is politically instigated. He highlighted the growing non-violent change of regimes, among other member states, the Gambia, Ethiopia, and Liberia and South Africa. “I also want to mention the achievements we have accumulated under the joint AU- Germany technical cooperation project in support of the operationalization of the African Peace and Security Architecture (APSA). The monitoring results of the APSA Roadmap and the annual APSA Impact, indicate a growing number of relevant interventions by the AU and RECs”. He at the same time briefed on the progress on the implementation of the decision on financing of the Union to fund its operations, programmes and peace activities. AU Member States have contributed over 40 million dollars to the Peace Fund. This represents the largest amount Member States have contributed to the Peace Fund since it was established in 1993. AU Member State collection target for 2018 is expected to reach 65 million dollars. Amb. Kwesi also took the opportunity to brief the Minister on the continent’s milestones in the implementation of Africa’s Agenda 2063, highlighting the recently established African Continental Free Trade Area, the Protocol on Free Movement and the launch of the Single African Air Transport Market, which he noted would boost intra- African trade, promote business and leisure tourism, labour and skills migration among other socio-economic benefits to the continent. 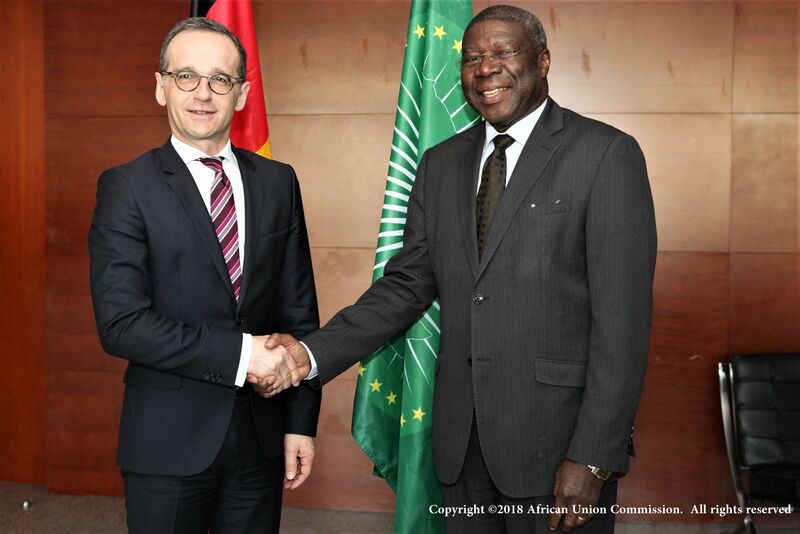 Later this year, the African Union and Germany will conclude on negotiations on development cooperation. In 2017, they held successful annual bilateral consultations on the development Cooperation. “We have over the years had very productive cooperation in key sectors of development such as education, job creation, integration and security as well as support in institutional Capacity Building Programme, and this is another opportunity to enhance the existing relations,” Amb. Kwesi concluded. Minister Maas, during the visit, also held bilateral talks AU’s Commissioner of Peace and Security, Amb. Smail Chergui, where they discussed further, the peace and security situation at the horn of Africa.